The Community Development and Knowledge Management for the Satoyama Initiative Programme (COMDEKS) was launched in 2011 to support local community activities that maintain and rebuild target production landscapes and seascapes, and to collect and disseminate knowledge and experiences from successful on-the-ground actions so that, if feasible, they can be adapted by other communities throughout the world to their specific conditions. The programme provides small-scale finance to local community organizations in developing countries to support sound biodiversity and ecosystem management as well as to develop or strengthen sustainable livelihood activities planned and executed by community members themselves. The target landscape for COMDEKS activities in Slovakia is the Laborec-Uh region in the Eastern Slovakia Lowland (Východoslovenská nížina), in the Bodrog River basin. The target landscape for COMDEKS activities in Slovakia is the Laborec-Uh region in the Eastern Slovakia Lowland (Východoslovenská nížina), in the Bodrog River basin. The territory is defined by the river Laborec in the west, the river Uh in the south, the Veľké Revištia-Bežovce canal in the east and Zemplínska Šírava Lake in the north. The target area is part of a low-lying depression that was once characterized by extensive wetlands and alluvial forests. Over the years, water from the basin has been drained through a network of drainage ditches, melioration canals and pumps. By 1990, 85 percent of the target territory had been drained, however water still has to be permanently pumped from the area to prevent partial flooding of agricultural land and settlements. The target area covers some 40,200 ha and includes 35 municipalities, with a combined population of approximately 22,750 people (2010). It has a rural character and a relatively low population density. The region is dominated by smaller municipalities; there are no large towns or cities. The largest municipality in the area is Pavlovce nad Uhom, which has 4,532 citizens. However, the town of Michalovce, with nearly 40,000 inhabitants, is located just outside the area, close to its northwestern border. The area was selected as a COMDEKS pilot landscape mainly due to its biodiversity and hydrological values, as well as its ranking as one of the most underdeveloped Slovak regions in terms of its social, economic, agricultural, and ecological aspects. Prior to the introduction of intensive agriculture and melioration practices, the landscape was covered by a combination of forest types, including softwood alluvial forests and hardwood bottomland forests on elevated areas. Water and wetland ecosystems were also widely distributed in the past, however large-scale drainage and deforestation of the area to create favorable conditions for intensive agriculture has altered the ecological characteristics of the region. Today, only forest remnants remain, and those can only be found in the southeastern part of the landscape—around the Stretávka, Tašula and Kristy areas. In the absence of forests, dominant land types today are arable land, meadows, grasslands and fishponds. Only a fraction of the original biotopes have been preserved. As a result, the target area shows low levels of ecological stability, and the remaining centers of biological diversity are not connected by biological corridors. Nonetheless, the area is still of great ecological significance, particularly with respect to waterfowl habitat. Some sections of the Východoslovenská nížina lowland landscape have been preserved and enlisted as part of the Convention on Wetlands of International Importance (the Ramsar Convention). The Senné fishponds (Rybníky Senné), which are along a major waterfowl migration route, are one notable example. The Ramsar site includes the National Nature Reserve (213.31 ha), where 145 bird species have been documented, of which 5 species are globally endangered and 53 species are endangered in Europe. The region is traditionally agricultural and pastoral. Even today, the most important economic activity is agriculture. However, low-fertility soils with high groundwater are an impediment. Indeed, agricultural productivity in the target landscape is lower than the national average. In addition, agricultural trends have had notable effects on agricultural land use. In the past few years arable land has been mostly used for growing crops subsidized by the main European Union agrarian support schemes—crops such as wheat, barley, corn, sunflower, and soya. Canola for use in bio-fuels production is also a significant crop, bringing with it the need for increased use of agrochemicals. On the other hand, growers of alternative and less typical crops suitable for lower-quality land are missing from the region. Cattle raising (beef cattle in particular) has been declining, even though the region has more favorable conditions for this type of activity. Cattle raising has traditionally been an important part of local agriculture, co-forming the landscape and playing an important role in its maintenance. The target area ranks among the regions with the highest unemployment rates in Slovakia, approximately 7 percentage points higher than the national average of 13.16 percent. Its peripheral position, deterioration of agriculture, demography, lack of investments and, above all, lack of capable local entrepreneurs (small and medium enterprises in particular), coupled with other socio-economic factors, have had a negative impact on the economic situation in the region. In the majority of municipalities there has been a significant drop in the number of inhabitants over the last 15 years. These changes are mainly caused by the lack of jobs in the region, low wages, low education level, and segregation of Roma communities, which have historically ranked among the most socially excluded groups of the Slovak population. At present, the occupational profile of the population does not reflect the developmental needs of the region and the change in regional conditions. The departure of educated and skilled youth from the region is a major and persisting problem, and, in general, there is a lack of educational and training programs for adults, such as life-long learning. Local agriculture is declining due to low soil fertility and challenging soil cultivation conditions, deterioration of the food-processing industry in the region, and unclear land ownership, as well as from emigration of qualified workers, and, last but not least, from the distorting influence of the European Union subsidy policy. This has resulted in abandonment of cultivation (mowing, grazing, etc.) in many fields, leading to their colonization by invasive weed species with low levels of biodiversity. In terms of surface water, high levels of PCBs constitute the most pressing problem. Even though the local production of PCBs ended more than 20 years ago, the consequences of long-term contamination are still present in sediments. Intensive agriculture and animal breeding represent another source of water pollution, resulting in high nitrate concentrations in wells, as well as high concentrations of artificial fertilizer residues and agro-chemicals. Lower water quality is also caused by industrial pollution, as well as sewage contamination. Currently, only 11 percent of inhabitants in the area are connected to the public sewage system. One of the factors exacerbating the agricultural problems of the area is the structure of land ownership, stemming from collectivization of agriculture in the 1950s. As a result of the seizure of privately owned land and the establishment of collective farms in the Soviet era, and of the not-so-clear returning of the land to the original owners in the 1990s, the link between land ownership and farming itself has been lost. Extreme fragmentation of plots has often resulted, many only a few hectares in size. These small plots are then often divided further into a number of even smaller lots. In addition, families frequently own several small land parcels that are located far from each other, making it difficult to farm them efficiently. Joint ownership is another complicating factor, where several people may own land without specifying who owns which part of it. The combination of fragmented ownership and the consequent need to gain the agreement of many different landowners in order to carry out a landscape-wide program is one of the obstacles to improving conditions on the land. The consultative process and baseline assessment undertaken to develop the Slovakia COMDEKS Country Programme Landscape Strategy used as its starting point the results of a previous assessment carried out in 2007-2009 during an earlier UNDP/GEF project called “Integration of Principles and Practices of Ecological Management into the Land and Water Management in Východoslovenská nížina Lowland.” The COMDEKS activities in Slovakia are expected to build on the lessons learned, the networks of partners and stakeholders and the strengthened institutions resulting from the earlier project. They will also be fully aligned with the Integrated Local Development Strategy that was one of the outputs of that project. To update and expand on the results of the earlier assessment, a two-day landscape-wide baseline assessment workshop was organized in August 2012. It was attended by 20 participants representing members of civic associations and volunteer organizations, village mayors, representatives of agricultural cooperatives and craft centers, and local communities. In all, 13 municipalities from the districts of Michalovce and Sobrance were included in the assessment. The workshop relied on maps compiled during the earlier UNDP/GEF project. The workshop facilitators used various methods, such as SWOT analysis, scaling sheets, and power point presentations on the landscape to catalyze discussions. In addition, the baseline assessment workshop piloted a set of landscape resilience indicators developed by the United Nations University and Bioversity International to help measure and understand the resilience of the target landscape. Using the indicator scoring exercise, stakeholders assessed the status of the target socio-ecological landscape and identified the main concerns that needed to be addressed in the area. The results of the indicator scoring exercise and subsequent discussion made it clear that while social equity and infrastructure issues have seen improvements in recent years, ecosystem protection and biodiversity conservation have declined, and require significant attention. Some stakeholders pointed out that although some knowledge of traditional crop growing practices still exists—especially regarding fruits, vegetables and herbs—these traditions are quickly dying out because of a lack of willingness to revert back to a perceived “traditional” way of life. The indicator scoring exercise served to engage stakeholders on important discussions regarding the likely future developments of community-led sustainable practices within the Slovak context, and participants confirmed that the resilience indicators helped them to better understand the need to link social and ecological aspects within the landscape in order to improve the region’s overall resilience. Table S-1 shows the four Landscape Outcomes agreed upon by landscape stakeholders, as well as the performance indicators that will be used to measure these outcomes. Improved ecosystem services through integrated water management and landscape regeneration. · Area (in ha) of natural ecosystems, including water bodies, with revitalized or improved quality of eco-system services. · Tons of CO2 retained due to the improved state of ecosystems. · Increased water retention potential (in m3) of the landscape due to the improved state of ecosystems. · Volume (in m3) of treated municipal waste waters (sewage). Strengthened agricultural production that promotes agro-diversity and landscape resilience through sustainable practices and systems. · Area (in ha) of production areas where sustainable management practices are applied. · Number and type of traditional varieties (cultivated plants) and breeds (livestock) grown and raised. Enhanced livelihoods through the development of small-scale production activities and businesses using local resources. · Number of small ecological/traditional enterprises created or strengthened that provide alternative livelihoods to local inhabitants. · Number/percentage of priority area inhabitants involved in clusters/partnerships supporting the production and sales of ecological/traditional local products and services. · Monetary value of ecological/traditional products and services created with the support of the program. Strengthened multi-stakeholder participatory decision making at the landscape level for greater resilience. · Number and type of networks and support mechanisms created. · Number of community members (gender disaggregated) actively participating in decision-making processes within supported projects. Outcome 1: Improved ecosystem services through integrated water management and landscape regeneration: Integrated management means the entire section of the basin area with all its elements (forests, bank vegetation, wetlands, agricultural soil, pastures, built-in areas, water surfaces, and water courses) is managed and protected as a whole. At present, it is often the case that these elements are cared for by a number of different entities, which results in a lack of synergy across the landscape. Drainage of the land and deforestation of the area have led to the degradation of the landscape, with disappearance of natural water courses and water bodies as well as the original vegetation. EU Water Framework Directive asks for the achievement of the so-called “good ecological status” on selected parts of water courses, revitalization of water courses, and the protection and regeneration of wetlands and bank vegetation. In order to revitalize the landscape, it is key to bring water and forests back to the selected landscape. Outcome 2: Strengthened agricultural production: Promoting traditional agriculture can provide a foundation for improved food production and a stronger local economy, as well as landscape integrity. Outcome 3: Enhanced livelihoods: Small enterprises should be based on sustainable utilization of renewable local resources and adding value to promote alternative livelihoods and increase overall income. Such enterprises should support landscape, skills, and resource diversity. Such forms of entrepreneurship should support enterprises arising from specific local conditions, potential, and needs and which can react flexibly to changes in the wider environment. European rural experience shows “being different” is immensely important. It might be difficult to compete with common everyday products, yet many good examples exist of positive development through products traditional to a region or which are little known and have the potential for added value. Outcome 4: Strengthened multi-stakeholder participatory decision-making at the landscape level: Continued mobilization and engagement of local stakeholders to form partnerships and cooperation networks is needed in order to improve their involvement in the decision making processes affecting the target landscape. Improving the awareness and capacities of local communities and civil society can provide a foundation for better planning and implementation of initiatives addressing local problems and needs, at the same time also contributing to national-level objectives. To this effect, the existing territorial public-private partnership should strengthen its capacity and codify its local-level experience; this can increase its potential for policy influence and enable it to be involved in decision-making affecting the target landscape on the national level. In addition, communities can get actively involved in decision making through engagement in project activities. This can take several forms: being a team member and project partner, being involved in processes initiated by the project (public discussions, opinion polls, petitions, training), or participation in systems established by the project (such as a regional tradition mark or quality mark, exchange of knowledge, and experience within networks). US$36,400 Outcome 1 Help to restore natural forest ecosystems in the Lower Zemplin region, specifically through tree planting on 12 ha in the villages of Hazin, Bajany, and Senne. 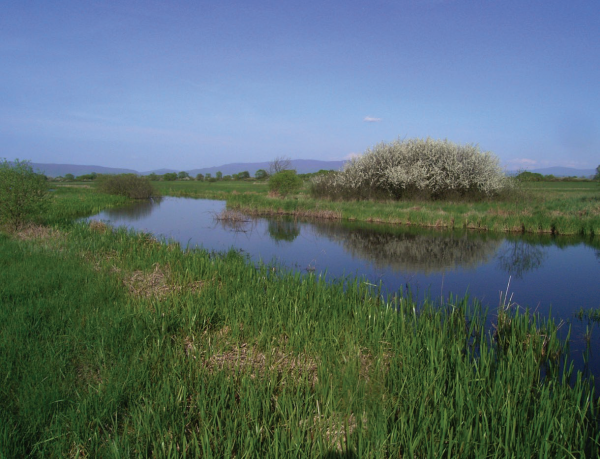 US$49,750 Outcomes 1, 2, 3 Ensure sustainable management of 110 ha of flooded meadows in the Eastern Slovakia Lowlands near Senne through restoration of cattle grazing to maintain favorable breeding habitat for waterfowl. Train tourist guides and maintain existing nature trail to increase nature tourism. US$27,200 Outcomes 1, 2, 3 Increase biodiversity, improve maintenance of the countryside, and increase local food self-sufficiency through expanded beekeeping and raising of domestic farm animals, as well as tree planting and habitat improvement. US$25,900 Outcomes 2, 3 Establish and operate local farmers markets to create a market for local organically raised food. Create a regional brand for local organic products. Expand the number of small farmers through public education and demonstration crops. US$39,950 Outcomes 1, 2, 3 Revive traditional breeding of waterfowl. Revitalize wetlands on which waterfowl feed and simultaneously rehabilitate natural water regime to improve flood protection and water availability during drought. US$50,000 Outcome 1 Improve water quality of the protected bird site called “Bird Paradise” as well the ground and surface waters near the village of Senne by constructing a low-cost plant-root wastewater treatment plant. US$9,130 Outcome 4 Strengthen the capacities of the local Civic Association Medzi riekami (Among the Rivers) so that it can effectively represent the interests of the Laborec-Uh region in planning and decision-making processes and regional development. Revival of small-scale and sustainable farming: A number of traditional agricultural practices were revived at small farms in the area, with special emphasis on promoting agro-diversity and creating new farming opportunities that would both recreate the traditional land mosaic and be harmonious with local waterfowl. This included establishing beekeeping and traditional breeds of goats, sheep, and pigs on four family farms; revival of traditional varieties of fruits and vegetables by 10 local producers on 100 ha without the use of chemicals; revitalizing abandoned rural land with native trees and shrubs; revival of open air breeding of ducks and geese on wetland ecosystems, making sure to keep them within the system’s carrying capacity; and revival of grassing and mowing in wetlands, respecting the natural water level fluctuation and the needs of nesting and migrating birds. Improving wetlands management and renewing forest ecosystems: Project activities brought integrated water management to a number of parcels and helped restore the natural water regime. For example, when a small, 2-hectare wetland next to a local farm was restored, it allowed the natural water regime of seasonal flooding to resume on an adjacent 68-ha meadow, on which waterfowl feed. Similarly, cattle were reintroduced on 95 ha of seasonally flooded meadows, supporting farm productivity while respecting habitat values and breeding activities. In addition, 15 ha of wetlands that host thousands of water birds during spring and autumn migrations were protected. These wetlands and meadows are also part of a Protected Bird Area designated under Natura 2000, which is a pan-European network of protected areas. In terms of forest renewal, educational meetings on the benefits of reviving local forests have been held in several communities, and replanting has now commenced in three villages, supported in part by children from local schools participating as part of their environmental education. Establishing and promoting a local farmers market: A farmers market is now operating in Zaluzice, serving 20 local producers selling products such as apples, potatoes, cabbages, eggs, jams, and handicrafts. The marketplace building is a retired school building offered by the local municipality that has been reconstructed by hiring local unemployed workers. The market operates once a month, usually in connection with a local event such as a farm competition, holiday party, or exhibition. Information leaflets promoting the market have been distributed to more than 5,000 people in the area. In addition, a network has been formed among local small farmers participating in the market to share experiences and help generate new ideas for marketing local products. Coordinating at a landscape and regional level: Several joint meetings of the groups involved in the different local landscape projects have occurred in the first quarter of 2014 to develop a system of supporting local production and the marketing of regional products. In addition, a regional fair was organized by COMDEKS projects and the regional authorities in Kosice and Presov to support the development of local partnerships in eastern Slovakia. The fair provided a convenient venue to share COMDEKS experiences with other interested groups in the area. Advocating for local concerns in regional development: The civic association Medzi riekami is a key player in implementing the Integrated Local Development Strategy developed in 2009, and also works with the Kosice Regional Authority as a member of its Working Group for Regional Development. With additional capacity building through coaching and internships, the group is now more able to participate in the organization of events such as conferences and seminars on the regional level to present local needs, recount local experiences, forge new partnerships, and generate new ideas for sustainable development in the Laborec-Uh region. COMDEKS projects have taken the initial steps in creating a landscape identity among the region’s communities that revitalizes traditional agricultural activities and land uses and makes them part of a modern, participatory local development process. In fact, COMDEKS projects have provided a new model for how “Local Action Groups” can pursue local development in a more sustainable manner. The European Union encourages the formation of “Local Action Groups” (LAGs) representing business and civil society in a particular micro-region in order to take advantage of financial opportunities associated with the EU, particularly related to local development. These LAGs, which have a diverse membership representing municipalities, civil society and local entrepreneurs, formulate Integrated Local Development Strategies to guide their efforts. COMDEKS-supported projects have created a momentum in the cultural landscape for biodiversity-friendly landscape management that contributes to economic and social development. In eastern Slovakia, a region that is coping with problems similar to those in the COMDEKS target landscape, COMDEKS experiences have been presented and discussed as best practices in terms of shaping water, soil and ecological management at the local level, and strengthening environmental considerations in the local development strategies that LAGs follow. Also, regional authorities have welcomed COMDEKS as a model combining a bottom-up and top-down development approach by involving the local stakeholders in the formulation of the objectives for a selected landscape, and at the same time defining the general objectives and the framework for implementation in a manner that contributes to the solution of global problems. The COMDEKS process successfully built on and enriched previous UNDP/GEF work in the area. Although small in size, the Laborec-Uh region was chosen because it was both one of the least developed areas in Slovakia and because the earlier project work provided a foundation on which to build. To some extent, local stakeholders were already mobilized and engaged in cross-sectoral communication and cooperation, and some measures to improve local ecosystem functioning had been piloted. On the other hand, the cooperation among stakeholders was too formal and weak, and many remained suspicious of efforts to introduce environmental measures. However, with the COMDEKS contribution, local partnerships have been strengthened, and the viability of measures integrating environmental, economic and social aspects has been demonstrated. At the same time, local capacities have been improved by direct participation in development and implementation of practical projects, leading to the fulfillment of a jointly developed strategy. Thus, in this area, long-term support to local groups has resulted in a broad partnership with empowered local actors. The provision of adequate facilitation, consultation, and technical support is important at every stage of COMDEKS planning and implementation. During the conduct of the baseline assessment and the formulation of the landscape strategy and project proposals, for example, COMDEKS stakeholders stressed the importance of a well-facilitated participatory process that also draws on external expertise. Support to local NGO grantees was even more important during project implementation, due to their lack of technical expertise and project management skills. Indeed, the involvement of external technical experts was crucial for the success of the projects, improving the cohesion of the projects and increasing the ability of the communities to take these projects on. The compressed timeframe of the planning and implementation cycle presented a challenge. The COMDEKS baseline assessment was conducted in August 2012, the national landscape strategy approved in October, and projects approved by the National Steering Committee in December 2012. Projects commenced in January 2013 with a 15-month window for implementation. While projects generally came in on time, the rapid implementation cycle to some extent pushed local stakeholders beyond their evolving capacity levels. This was mitigated to some degree by more intense support during preparation and implementation of COMDEKS projects and by involving external technical expertise.